AD Architects has designed a new Kitchen, Dining Halls and Children’s Centre which blends in with adjacent traditional buildings and the surrounding area. This project was completed in December 2017. The new building replaced outdated 1940s Horsa huts and comprised two new large interconnected halls, kitchen, stores and a new children’s centre with separate entrances and external play areas. The project required extensive enabling works, including a new temporary kitchen whilst the main works were undertaken. 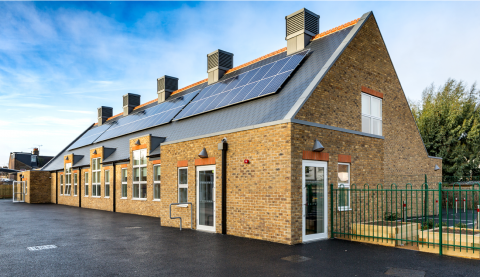 The project had a traditional procurement route and was part-funded by the ESFA as part of a pilot project for its Priority Schools Building Programme 2 (PSBP2).